The city of Phoenix will mark the 30th anniversary of the Phoenix Arts and Culture Commission with a celebration of the arts in downtown Phoenix on Oct. 3. 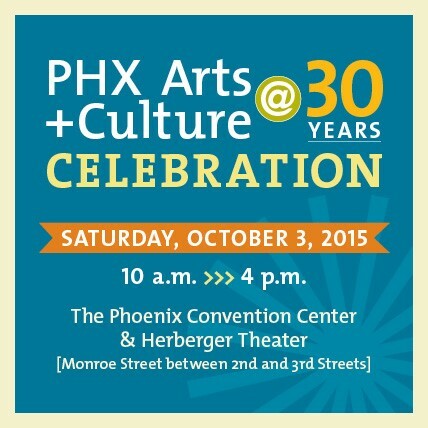 The PHX Arts and Culture @ 30 Years Celebration, will take place from 10 a.m. to 4 p.m. at the Phoenix Convention Center, Herberger Theater and on Monroe Street between Second and Third Streets in downtown Phoenix. The multi-site event will feature music, dance and theater performances, talks and art making demonstrations. In addition to the contributions of the nearly 100 arts and culture organizations, the celebration will also feature downtown public art tours, food trucks and activities for people of all ages. Nominees for the fourth annual Mayor’s Arts Awards will be announced from the main stage. PHX Arts and Culture @ 30 Years is sponsored by the Phoenix Office of Arts and Culture, the Arizona Commission on the Arts, Reimagine Phoenix, City of Phoenix Water Services Department, Phoenix Sky Harbor Airport, and the Phoenix Convention Center and Venues. The Phoenix Arts and Culture Commission was established in 1985 by the mayor and city council to “protect, enhance, serve, and advocate excellence in the arts for the people of Phoenix in their City.” Over the past 30 years Phoenix has experienced an exciting proliferation of arts and culture activity. The Phoenix Public Art Program has collaborated with artists and designers to create more than 180 major public art projects throughout the city. The expansion and creation of cultural facilities, such as the Phoenix Art Museum, Children’s Museum of Phoenix, Arizona Science Center, Phoenix Theatre, Ballet Arizona, Arizona Opera and Black Theatre Troupe, have dramatically changed the cultural landscape of Phoenix. A 30-year investment in a community grants program has nurtured the development of non-profit arts and culture organizations, which now number over 160 within the Phoenix city limits, and supported delivery of cultural services to Phoenix residents in the form of community outreach and arts learning programming. The non-profit arts and culture sector has become a $300 million economic driver for the city of Phoenix. For more information on PHX Arts + Culture @ 30 Years Celebration and a full list of participants, please visit phoenix.gov/arts or call (602) 262-4637. RSVP to the Facebook Event Page. Please follow the Phoenix Office of Arts and Culture on Facebook, Twitter, and Instagram #PHXArts30.